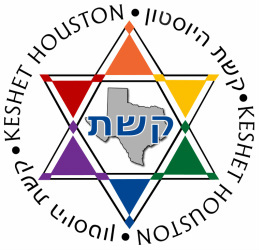 Keshet Houston, Inc., brings the Jewish and LGBT communities together in Houston and Southeast Texas. We offer a wide range of social and spiritual activities for gay, lesbian, bisexual and transgender Jews and their families. We hope you'll join us soon! Saturday, April 13, 2019, 7:30pm - Games Night: Join us for board games and refreshments at Mark's House. If you have a favorite board game, bring it! RSVP to info@keshethouston.org or on the Facebook event invitation for the address. Friday, April 26, 2019, 7:00pm - 8th Night Pesach & Shabbos Dinner: Our traditional dinner at Michael and Kevin's house. RSVP required before April 23. Address and directions will be emailed on the 25th. Saturday, May 18, 2019, 7:30pm - Movie Night: Join us for a movie and refreshments at Gail's house. RSVP to info@keshethouston.org or on the Facebook event invitation for the address. Friday, May 31, 2019, 7:00pm - Fifth Fridays Shabbos Dinner: Join us at Grant and Steven's house for a brief Erev Shabbos service, followed by a potluck dinner. RSVP is required before May 29. Address and directions will be emailed on the 30th.